Long a downtown ruin interest in the fate of the Albert Kahn designed movie palace increases as all around it rises. 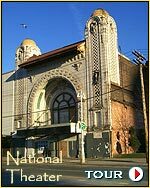 When and where did your family first settle in Detroit? Cool Train Pic - Can someone confirm location? 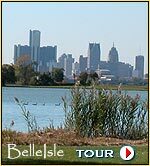 Detroit's crown jewel, Belle Isle Park, holds many warm memories for Detroiters. This magnificent island of calm and beauty sitting amid the Straits of Detroit between Canada and the United States, offers visitors the most dramatic views of our international metropolis. A long struggle has played out over the years as to whether or not the island should be used for commercial ventures. While these attempts have been successfully resisted in the past, the precarious condition of the City of Detroit's budget may threaten that independence with the return of the Grand Prix auto racing leading the way. 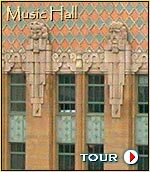 The Music Hall Theater is now host to the Jazz Cafe at Music Hall. The DetroitYES eNEWs is an audience-driven International Metropolitan Detroit newsletter produced by AtDetroit, LLC and highlighting the discussions of the DetroitYES forums. Links on this page lead to live discussions on the DetroitYES forums. You are invited to read and join those discussion. If this was mistakenly sent to you or you do not wish to receive further issues please CLICK HERE TO UNSUBSCRIBE and have your email address removed from our mailing list. We apologize for any inconvenience as we strive to make this newsletter available only to those who wish to receive it.